Earlier in April we posted about Hannes Fasching (OE5JFL)’s work in detecting pulsars with an RTL-SDR. Thanks to Steve Olney (VK2XV), administrator of the Neutron Star Group for pointing out that there are actually several amateur radio astronomers who are using RTL-SDR dongles for pulsar detection. A pulsar is a rotating neutron star that emits a beam of electromagnetic radiation. If this beam points towards the earth, it can then be observed with a large dish antenna and a radio, like the RTL-SDR. Pulsars create weakly detectable noise bursts across a wide frequency range. They create these noise bursts at precise intervals (milliseconds to seconds depending on the pulsar), so they can be detected from within the natural noise by performing some mathematical analysis on the data. Typically a few hours of data needs to be received to be able to analyze it, with more time needed for smaller dishes. 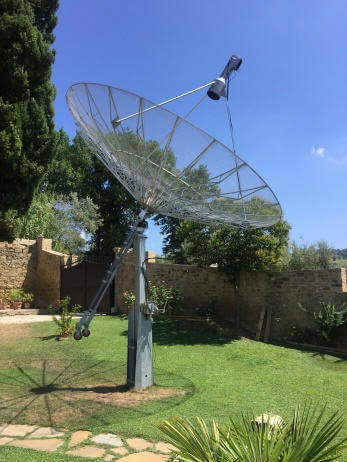 Andrea Dell’Immagine (IW5BHY) – Based in Italy Andrea often uses a 3D corner reflector antenna which is equivalent to a 2.5 meter diameter dish to observe pulsars in the 70cm band (~420 MHz). The antenna is in a fixed position so he can only detect pulsars that drift into the beam width of the antenna. With this antenna, a 0.3dB NF LNA, an RTL-SDR and de-dispersion techniques he’s been able to detect the Pulsar B0329+54 which is 2,643 light years away with an integration time of about 3 hours. 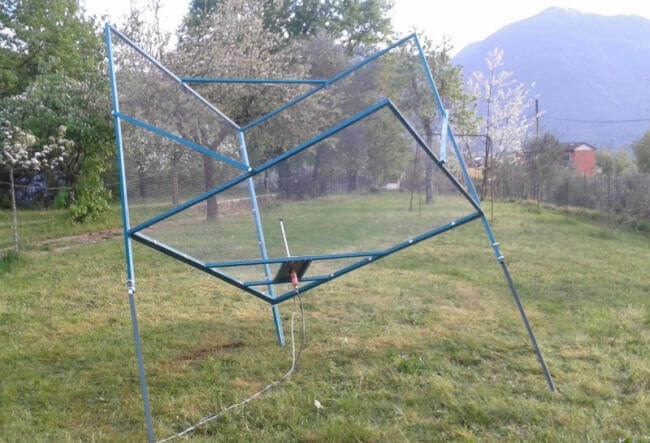 Andrea (IW5BHY)’s 3D Corner Reflector Pulsar Detection Antenna. Andrea has also used a 4M dish to detect Pulsar B0329+54 also at 70cm with an RTL-SDR. With the larger dish he’s able to detect it within about 40 minutes of integration time. Hannes Fasching (OE5JFL) – Based in Austria Hannes has a 7.3M dish that he uses for pulsar detection with his RTL-SDR. 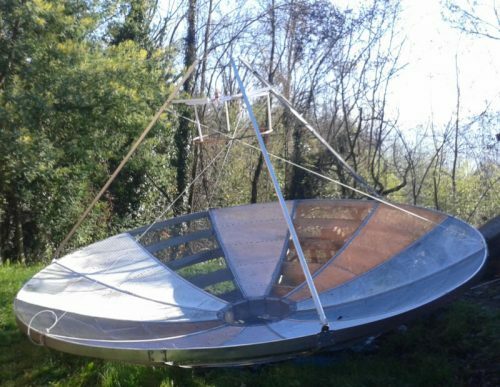 With this large dish he’s been able to receive 22 pulsars at both 70cm (424 MHz), and 23cm (1294 MHz) frequencies. With such a large dish, detecting a strong pulsar like B0329+54 only needs less than a minute of integration time. Mario Natali (I0NAA) – Based in Italy Mario uses a 5M dish to observer pulsars at both 409 MHz and 1297 MHz. Combined with a low noise figure LNA and his RTL-SDR he’s been able to receive the B0329+54 pulsar with an integration time of about 2 – 2.5 hours. Michiel Klaassen – From the Dwingeloo Radio Observatory in the Netherlands Michiel has used their large 25M dish and an RTL-SDR to detect B0329+54 at 419 MHz. Peter East & Guillermo Gancio – Peter and Guillermo have used the large 30M dish at El Instituto Argentino de Radioastronomía (IAR) in Argentina and an RTL-SDR to detect the Vela pulsar (B0833-45) at 1420 MHz. In terms of hardware required, from the above projects we see that you’ll need an RTL-SDR dongle (other more costly SDR’s could also be used), a dish as large as you can get (along with some sort of dish pointing system), a low noise figure amplifier (0.5dB or less is desired) to be placed right by the dish, a few line amps if the cable run is long and perhaps a filter if you are seeing interference from terrestrial signals. An overview of software for detecting pulsars with the RTL-SDR can be found over on the Neutron Star Groups software page. Essentially what you need is an analysis program which can work on the raw IQ data that is collected by the RTL-SDR and dish antenna. This software ‘folds’ the data, looking for the regular noise bursts from the pulsars. The output is data that can be used to create a graph indicating the spin period of the pulsar, and thus confirming the detection. Graph showing the half-period of B0329+54. 350 * 2 = 700 ms which is about what matches on the B0329+54 Wikipedia page.